LAS VEGAS, Nevada – HARMAN’s Crown Audio today announced its DCi Network Display Amplifiers are the first professional audio endpoints to receive AVnu certification for Audio Video Bridging (AVB) interoperability from the AVnu Alliance, the professional audio industry’s only organization dedicated to driving open, standards-based AV networking through the certification of AVB products for interoperability. Crown’s flagship DCi Network Series amplifiers set a new standard for power and flexibility in large-scale installed sound applications. The eight-channel DCi 8|600ND delivers 600W into eight ohms (300, 600 and 300W into 16, four and two ohms) and the four-channel DCi 4|1250ND provides 1250W into eight, four or two ohms (625W into 16 ohms). 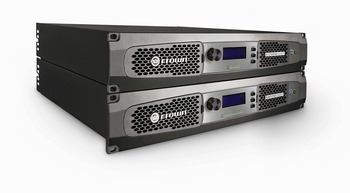 Both amplifiers offer direct drive “constant voltage” capabilities for 70Vrms and 100Vrms amplification without the need for a step-up transformer, yielding higher audio quality in distributed audio applications with power outputs of 1250W and 600W respectively. Like all Crown DCi Series amplifiers, the DCi 8|600ND and DCi 4|1250ND take advantage of HARMAN’s proprietary DriveCore amplifier IC chip for powerful, highly efficient operation from a compact form factor measuring just two RU high. The DriveCore chip combines the amplifier driver stage into the power output stage along with additional audio-signal functions, yet is about the size of a postage stamp. The DriveCore-based Class D, next-generation PWM design dramatically reduces size and power consumption and yields a much more energy-efficient operation. Crown DCi Network Display Amplifiers passed the testing procedures at an AVnu-appointed test house. AVnu Alliance funds the development of certification testing and its members are responsible for ensuring AVNu Alliance’s IEEE AVB compliance program meets demanding performance benchmarks. This is the first and only independent AV networking certification test program. Certification, which is available to any member, is based on testing that takes place at the University of New Hampshire InterOperability Lab (UNH-IOL), which serves as AVnu’s independent testing facility. “AVnu Certification provides in-depth validation of member products against established standards enabling a healthy multi-source ecosystem,” said UNH-IOL’s Bob Noseworthy. The AVnu Alliance is dedicated to the advancement of streaming audio video by promoting the adoption of IEEE 802.1 Audio Video Bridging (AVB) standards over the network infrastructure. The organization strives to create an open path to AVB standards, define AVB compliance test procedures, and an AVnu certification program that ensures AVB interoperability of networked A/V devices to provide the highest quality streaming experience in professional A/V, automotive, and consumer applications to deliver a compelling end user experience.